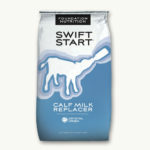 The Swift Start® Calf Program is founded on the belief that healthy and vigorous calves develop into profitable cows. University research has shown that enhanced calf nutrition can result in improved heifer breeding programs and up to 3,000 lbs more milk during the first lactation. 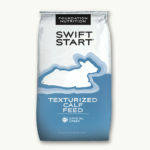 The Swift Start® line of calf products are developed using only the highest quality ingredients and formulated to an exacting standard. Calves are the future of every dairy operation; if you want to maximize their genetic potential, look to the comprehensive Swift Start® Calf Program.